Foxy Bingo shocks the bingo community with a drastic move! The industry gossip cogs have been churning today after the most recent fracas Foxy Bingo has had with, well, everybody. “Whats happened to the bonuses, used to get £5 free if you put £10 on now nothing”. “The site has now become a casino site and REALLY doesn’t care about its customers now!! I was one of the few who stuck up for Foxy and persuaded a few folk to join, now I don’t tell anyone to join”. “The reality is they are losing players which means no money which means more expensive tickets and room closures”. One voice of reason (in the minority it seems) says “Foxy is a business and its making changes. Like all businesses do. There is no point complaining. Be patient and try and enjoy”. Insider reports have surfaced that the Chat Hosts were, to put it nicely, ‘let go’ and the work has since been outsourced to the Philippines for a fraction of the price. Some ex-CH’s have claimed, though it’s not the fault of Foxy but of the employer, that they worked for 16 hours without breaks, weren’t allowed away from the computer for more than 5 minutes without a warning or even firing, and were paid a surprisingly low £5.50. 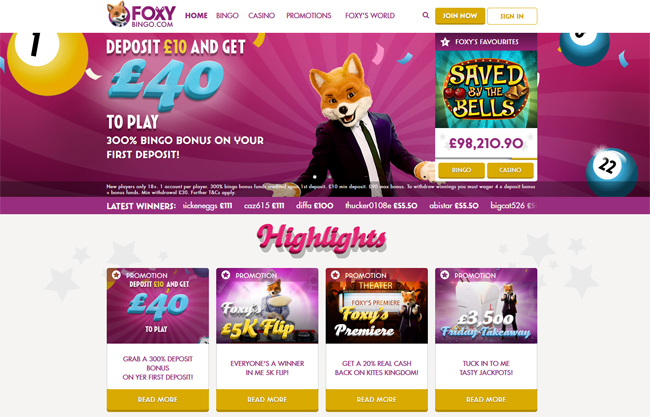 “(Foxy) have abruptly severed their relationships with a number of long-term marketing partners, including BingoPort, in a manner which we deem to be immoral, unethical and generally unacceptable”. Yowsers. No amount of Geordie Shore or TOWIE celebs can save Foxy (or as it’s known by some, Fixy) Bingo now! “It's not wrong to imply that there will be financial implication in my opinion because historically, with every change Foxy has made (Cashcade sale, bwin.party sale) there have been changes to promotional schedules etc and not for the better”. Well I think it’s safe to say that Foxy might be running for the safety of their log pile house to wait for this to all blow over. Leave a comment if you have something to say about it.